TANDEM LIFT FROM MV HHL VALPARAISO LOADING 'PAT M' FOR VOYAGE TO VENEZUELA. BACKHOE DREDGER 'PAT M' SIDECASTING MATERIAL DREDGED TO FORM A TRENCH OFF MONCOFA, SPAIN. CRANE BARGES 'MORTLIFT' AND 'REBECCA M' INSTALLING A BIRD ROOSTING PLATFORM AT GOXHILL, RIVER HUMBER. CRANE BARGE 'COLLINGHAM' ALONGSIDE THE COMPLETED BIRD ROOST AT GOXHILL, RIVER HUMBER. BACKHOE DREDGER 'PAT M' WORKING WITH THE HYDRAULIC HAMMER IN CASABLANCA. MANOEUVRING 'PAT M' INTO POSITION ON THE DECK OF THE HEAVY LIFT SHIP FOR THE VOYAGE TO VENEZUELA. CRANE BARGES 'MORTLIFT' AND 'REBECCA M' INSTALLING PILES FOR THE PROTOTYPE TIDAL GENERATOR 'NEPTUNE', RIVER HUMBER. VESSEL CONSTRUCTION AT NORTH KILLINGHOLME. CUTTER SUCTION DREDGER 'JOHN M' WORKING FOR THE ENVIRONMENT AGENCY CLEARING A CREEK. 'REBECCA M' REPLACING WALL PLATES IN THE LOCK PIT AT IMMINGHAM, RIVER HUMBER. Humber Work Boats Ltd is a family owned private Company which has been trading since 1974 as Marine and Dredging Contractors. 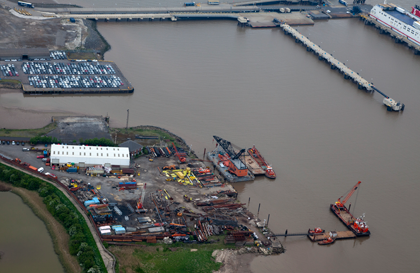 The Company owns their 3 and a half acre facility at North Killingholme Haven on the south bank of the River Humber which incorporates spacious office accommodation, a 10000m3 fabrication shop, two hundred and fifty metres of riverside frontage and extensive yard space. The Company has developed its Marine Contracting and Dredging services significantly in recent years in local, national and international markets. The Company owns and operates a fleet of Multicats, Work Boats, Light and Heavy lift Crane Barges, to support its Marine Contracting Division and the Dredging Division operates Backhoe and Cutter Suction Dredgers. With its highly experienced workforce the Company offers bespoke Marine solutions to its well established and ever expanding local, national, and international customer base. Grimsby, North East Lincolnshire DN40 3LX.